From the NME: The elaborate artwork for the new RADIOHEAD album is yet again set to become a collector’s item as ‘HAIL TO THE THIEF’ is revealed in the form of a road-map. The group, who based the artwork to last album ‘Amnesiac’ on an old library book, have designed and made ‘Hail To The Thief’ in the format of a road map and a number of early copies of the album come in the form of a real fold out map, as pictured on the right. The sleeve also gives an alternative name for each song. Speaking exclusively to NME.COM, Thom Yorke explained the thinking behind it. He revealed that in the political fall-out of the September 11 attacks on the US and subsequent war in Afghanistan, certain phrases used on the radio stuck out to him. Yorke has also told the BBC that he was reduced to tears on hearing new single ‘There There’ finished for the first time. The track has had a famously long gestation period, and at one point was considered ‘lost’ by band insiders. “I blubbed my eyes out,” he said. “I went to LA and Nigel (Godrich, the band’s producer) played me the mix and it just made me cry, I was in tears for ages, I just thought it was the best thing we had ever done. There was something about it, I loved what he did. ‘There There’ is released on May 26. 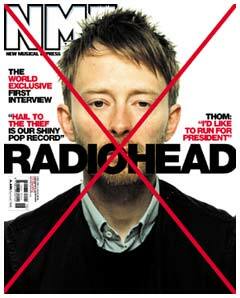 For an exclusive interview with Radiohead on their new album, out June 9, see this week’s NME, dated May 3.